Sometimes a girl has just got to splurge — and sometimes a girl is still feeling the effects of her semester’s tuition and has to bury what little cash she has. It does indeed sound simple to protect it like the precious commodity it is, but let’s face it: spending money is a reality. (I was paying attention in economics!) And for most college-aged women, fall is when we need money to boost our wardrobes for fall. I mean, where would we be without comfy sweaters and sturdy riding boots? Cold and sad, that’s where. Not to worry, though! I have been avoiding the piles of homework on my desk to help us achieve that fall wardrobe without doling out cash like a Super PAC. So grab a pumpkin latte and enjoy the beautiful designer items on the Wish List, but definitely check out what fall essentials under $55 you should be buying now on the Must List. 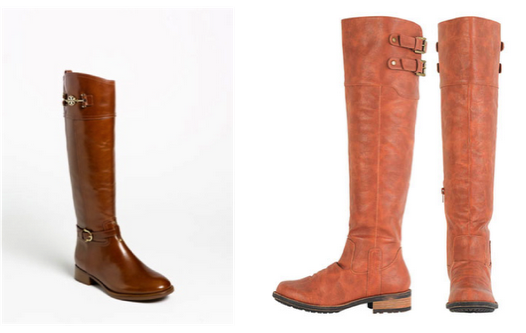 If you’re like me, you have had a pair of riding boots on your wish list for years. Some don’t fit and some aren’t the right color chestnut. Then there are these Tory Burch riding boots available at Nordstrom. In my best Rachel Zoe voice, “Die.” The color is the right shade to not clash with deeper browns or burgundies in your fall wardrobe and the gold details make them look like you aren’t out to muck the stable. The catch? A $495 price tag. Ouch. But never fear because I found these Alloy boots in almost the exact color for $55. Alloy usually has great sales going on 24/7, so be sure to keep your eye on their website for even more steals. Between the collar (a must-have trend) and the rich color, I am totally sold on the Mulleavy sisters’ creation for fall. It’s chic and ladylike without being prim, so it’s no wonder that uber-hip French boutique Colette has the dress listed at nearly $3,000. A girl can dream, right? 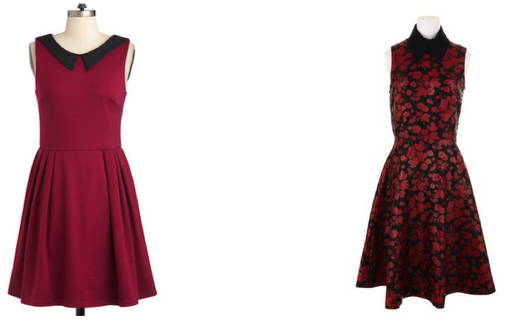 But being the savvy fashionista I am, I stumbled upon this ModCloth version for only $53. I’m not the best at math, being a journalism student, but that’s a lot less, ladies. It has the same collar and rich color that can transition from day to night, heels to boots or tights to bare legs in the spring. 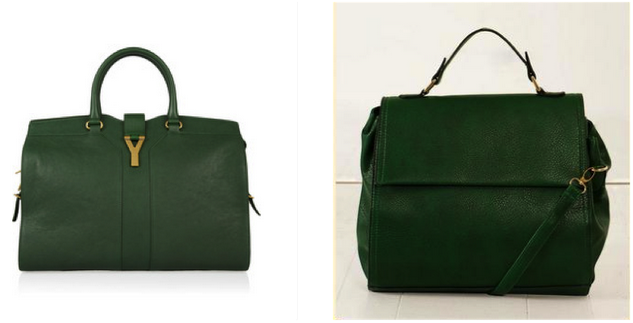 Rich, emerald green is hands down the color to keep your eye on. Like any great trend, it looks great on accessories, too. Enter this YSL stunner, a.k.a. the prettiest bag of the season. The “Cabas Chyc” is made of rich leather, and I must agree with Net-a-Porter’s description that it is an investment piece. So much so that it costs over $2,000. My recommendation? Pick up this great bag from Francesca’s Collection, which also opened a store recently in the Columbia Mall. My favorite part of Francesca’s $48 version is the additional arm strap that comes in handy when you’re trying to juggle keys and books. It isn’t everyday that you can find me gawking at what many would deem “merely a coat.” But this, ladies and gentlemen, is not just any old coat, but a Burberry one that I would literally sleep in no matter the weather. 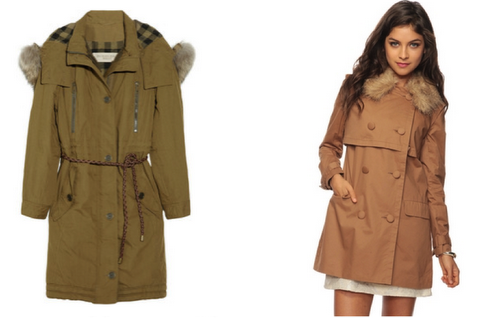 The parka is in classic Burberry tan and boasts the iconic plaid that most fashionistas dream of owning. Why this style is so essential is the versatility of such a piece: fall, spring or early winter, you have your bases covered. But being Burberry, expect a to pay well over $1,000. If you are left out in the cold on the price tag (bad joke, I know), try this version from Forever 21. It has the trimmings and classic shape of the Burberry original but for $40, you can actually afford your rent and meals! This is the perfect piece to pull on for the trek to class on chilly days in fall (the thinness of the coat won’t double for Missouri’s unbearable December days, unfortunately). Ditch the hoodie and try pairing it with skinny jeans and boots for the ultimate fall look that screams ‘college woman,’ not high school football game. There is nothing that screams “fall!” to me quite like J. Crew and Italian cashmere. I think I would have to revoke my previous statement that I would sleep in the Burberry parka because it has nothing on cashmere, especially a cashmere cardigan. Can you spell heaven J-C-R-E-W? Because I do. Take the ultra-soft fabric of cashmere and couple that with the richest colors and you have a winner for any occasion and any season. The only downside? $238. Don’t leave that J. Crew page just yet ladies, because my go-to place for that J. Crew esthetic without the price tag is their factory page. Here you will find all the best trends for a fraction of the cost. Think a sample sale available all day, every day. 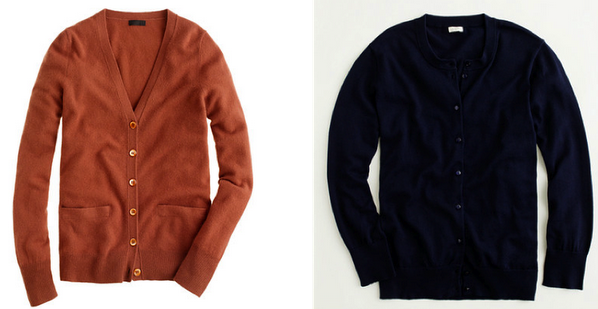 For example, these factory cardigans are offered year-round with the colors typically changing seasonally. The best part is that it's still a part of J. Crew’s shopping page and ships with items you buy from the regular J. Crew so any splurge items from the main site can ship with their equally as fabulous factory counterparts. Besides the traditional navy and various shades of maroon you see everywhere in the fall, step out of your color comfort zone in mustard. While not for everyone, this family member of Mizzou gold is an interesting way to turn an otherwise ‘blah’ outfit into a fashion forward one because the color is so unexpected. While you can start small with a mustard cardigan that I saw everywhere while shopping for this post, I prefer a pant or trouser in this marigold/mustard color. 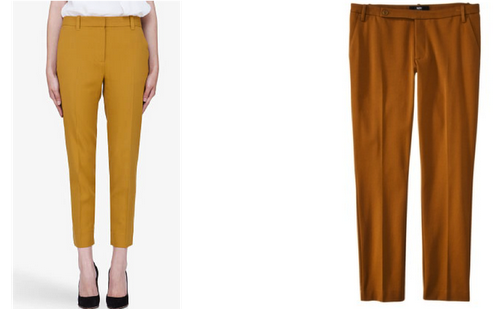 The trouser is an essential in any man or woman’s wardrobe and you can really show your style with these 3.1 Phillip Lim beauties. The I-am-broke $22 alternative from Target in toffee are just as chic and hit at the ankle just as the $350 ones do. They are simple for class or for meeting the girls and can be paired with everything from a chambray shirt to a chiffon blouse. I would style the look with another hot trend, polka dots, or with a cable-knit sweater in navy or cream.